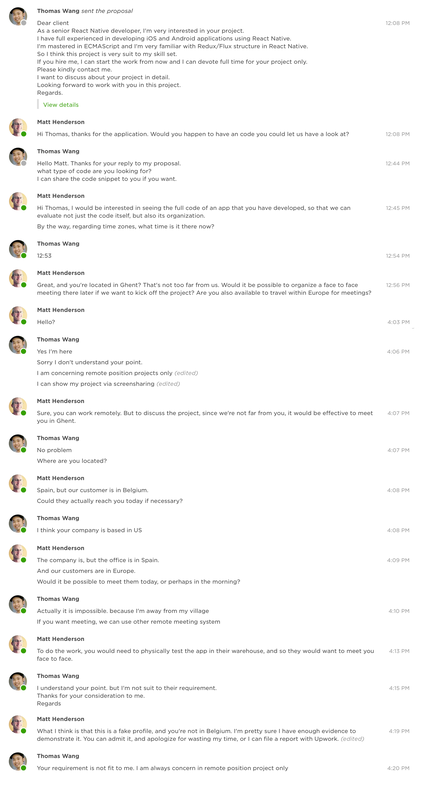 When sourcing work at Upwork, we tend to look for staff who are located in Europe, so that we have the chance to work in our timezone and have face-to-face meetings. A big problem, however, is fake profiles—people who are obviously not from Europe, posting profiles pretending they are. On December 1, the Canadian company formerly known as BitGold, sent an email to their customers, announcing a change that fundamentally affects how their customers use and experience the service. The essence of the message was that BitGold customers with holdings of more than 1,000 grams of gold could no longer use the service as place to continue accumulating gold savings. For those customers wishing to continue saving, they would need to create an account with GoldMoney, the UK company that BitGold acquired earlier in the year. Annual storage costs of 0.12% to 0.18%, when previously storage was free. Loss of ability to purchase gold with a credit card. Loss of the ability to make online vault-to-vault transfers. A degraded online user experience. You’ll likely have to go through KYC/AML procedures again. Overall, this announcement was not terrible news. Compared to similar services, BitGold/GoldMoney is still competitive. 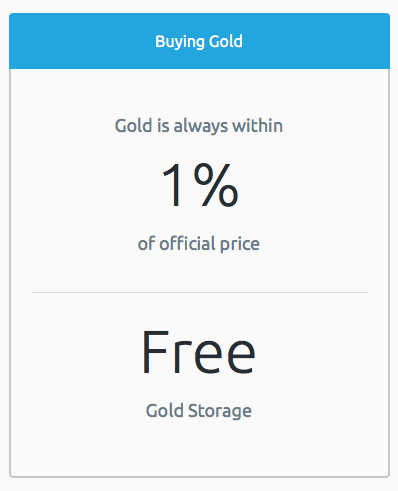 And through the maintenance of accounts at both BitGold and GoldMoney, one can still maintain 1kg of gold for free at BitGold, and even avoid the high purchase commission by purchasing at BitGold, and transferring to GoldMoney. 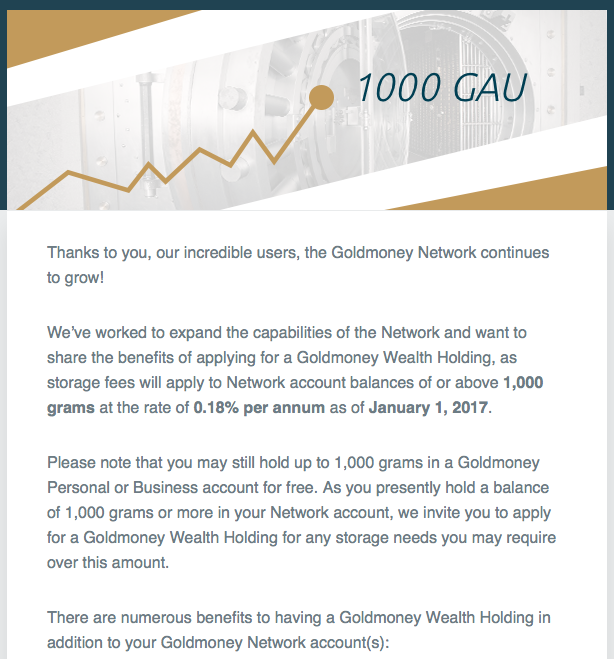 We’ve worked to expand the capabilities of the Network and want to share the benefits of applying for a Goldmoney Wealth Holding, as storage fees will apply to Network account balances of or above 1,000 grams at the rate of 0.18% per annum as of January 1, 2017. Please note that you may still hold up to 1,000 grams in a Goldmoney Personal or Business account for free. As you presently hold a balance of 1,000 grams or more in your Network account, we invite you to apply for a Goldmoney Wealth Holding for any storage needs you may require over this amount. This communication was ambiguous, confusing and played down how fundamental this change really is. It didn’t explain why the change had to happen, nor the impact it would have on affected customers. In fact, I did approach them first. But at that point, none of the emails I’d sent to their support department since mid-November had been responded to, and the ones specifically about this announcement still haven’t! After posting my blog article, and the ensuing Twitter conversation, I was contacted both publicly and privately by other BitGold/GoldMoney customers, expressing agreement with my sentiment, and disappointment in Roy’s response. We’re young. We’re growing. We’re trying to innovate in an old, creaky and heavily-regulated system. It might get a little messy as we figure things out, but we’re capable, and we’re onto something good—so bear with us, because in the long run you’ll be glad you did. Our company is bidding on the re-development of an existing product that has outgrown the technical framework on which it was originally built. The customer has received a handful of offers, and the range of costs and technologies found in those proposals is causing him considerable uncertainty in his choice. In response to that uncertainty, we’re nudging him to look beyond whether to use Ruby on Rails (our choice), Meteor or Laravel since, at the end of the day, the success or failure of his business will not hinge on technology. Instead, we’re encouraging him to consider the difference between a developer and a product designer, and focus on the critical question of who is capable of creating a product that will ultimately prove successful to his business. When the account screen is accessed, I’ll query the database for all colleagues. And to account for the case there are no colleagues, I’ll show the message, ‘No colleagues found’. Most developers focus on requirements and technology—i.e. the database query, the message to show if the query returns nothing, etc.—and fail to reflect deeply on the actual use of the product they’re building. In this case, the developer didn’t consider the one instance—and a critical one in terms of product success—of an empty database query that every single user will experience—Their very first engagement with this screen as a new user. Where am I, and what am I supposed to do? The “No colleagues found” text seems like an error message. One minute in, and I’ve already done something wrong? “Show blocked colleagues?” What is a blocked colleague? If I click that, the only thing that happens is that the text changes to “Hide blocked colleague”. Had I created this account as a potential new customer wanting to “kick-the-tires,” there’s a good chance that I’d leave and not return, since experiencing friction in my very first interaction with the product is probably a good indication of what’s to come should I stay. A good product designer is continually putting himself or herself in the shoes of the user, taking into account their context, their mindset, their knowledge and expectations, and looking to resolve any aspects of interaction with the product which potentially introduces friction. And therein lies the enormous difference in value between the average developer, and the very few who are good product designers. The former creates collections of features that “satisfy requirements”, while the latter creates coherent, effective and ultimately successful products. One of my favorite podcasts, recently discovered, is StartUp, by Alex Blumberg, former producer at This American Life. The podcast chronicles the story of starting Gimlet Media, Alex’s new business aimed at creating a network of story-narrative podcasts. “StartUp”, documenting their own story, is Gimlet’s first production, and what’s interesting about this podcast is that Alex records almost all of his conversations along the way, giving us uniquely inside access into the creation of their company. In a recent update we made to a customer’s software system, a bug was discovered, which led to a discussion about (a) why the bug wasn’t caught during testing and (b) why we charge them to fix the bug. Given our business model, this is a discussion that occurs from time to time, and so I decided to capture our viewpoint in the form of an article I can refer to as needed. In a conversation with the BBC, Motorola president Rick Osterloh had some words to say about Apple’s pricing. Continue reading Is Apple’s pricing fair? Posted on February 20, 2015 February 26, 2015 Categories BusinessTags BusinessLeave a comment on Is Apple’s pricing fair? Over on Rantbox, I posted a note about 9to5mac killing their full RSS feed, in the same way that TUAW did a while back—which, for me, marked the beginning of TUAW’s decline. Today I received an email from Nate Westheimer, founder of the Picturelife service I use to store, manage and enjoy my photos and videos, announcing that the service had been acquired by StreamNation. What caused this customer to delete our app and give it a one-star review? This is the disappointing story of a user who decided to delete Rego, and give it a one-star review. Continue reading What caused this customer to delete our app and give it a one-star review? Posted on January 12, 2015 May 25, 2015 Categories BusinessLeave a comment on What caused this customer to delete our app and give it a one-star review? Can we jump on a 15 minute call? What’s a good time for you this week to jump on a 15 minute call? It’s pushy. It puts you on the spot. It jumps right past the question of whether you’re ready or even want to have a call. It’s an attempt to move the conversation out of the comfortable world of email, in which you’re in the driver’s seat and can put time and thought into your response, and into the arena of the door-to-door salesman, where no matter what you say, they’ll have a readied response, and you simply won’t get away without making some kind of commitment, even if that’s just confirming a time for the next call. Posted on November 27, 2014 Categories BusinessTags BusinessLeave a comment on Can we jump on a 15 minute call? RaceSplitter is an app that provides “do it yourself” timing of sport events. It’s been on the market for three years and has gone through 13 different Apple-reviewed versions. Yesterday, we were surprised to receive an app-rejection notification related to a minor-maintenance release. Back in August, I purchased a 4TB G-Drive at the Apple Store in Marbella to serve as the destination that CrashPlan uses when backing up our family’s various Macs. Last week, CrashPlan started getting stuck; stuck synchronizing file information, and stuck backing up our data. The superb staff at Code42 inspected my CrashPlan logs, and discovered numerous read and write errors on the disk. Although Disk Utilities and Tech Tool Pro both reported that the disk was fine, the venerable Disk Warrior got “stuck” in its (evidently much deeper) drive check. Convinced that the drive had problems, I then set off to the Apple Store—four-month-old purchase receipt in hand—to get a replacement. After explaining the problem to the Apple Store employee, he replied that Apple only takes back disks during the first three months; after that, the customer has to deal directly with the manufacturer. He then volunteered to help me identify the manufacturer’s contact details. Waiting to get an email back from G-Technology with shipping instructions and an RMA number—probably preceded by several “Can you try restarting the drive?” emails. Finding some brown paper to wrap up the box for shipping. Traveling to the Marbella post office and waiting in line for an hour to ship the thing. Traveling back to the post office a month later to figure out why the shipment never arrived. …all the while, not having a backup at home, because the drive is getting repaired. Then a few minutes later, returning from the back room, he reported that unfortunately Apple didn’t have any more of those particular drives in stock. But, they did have a 4TB Seagate drive they could offer me. 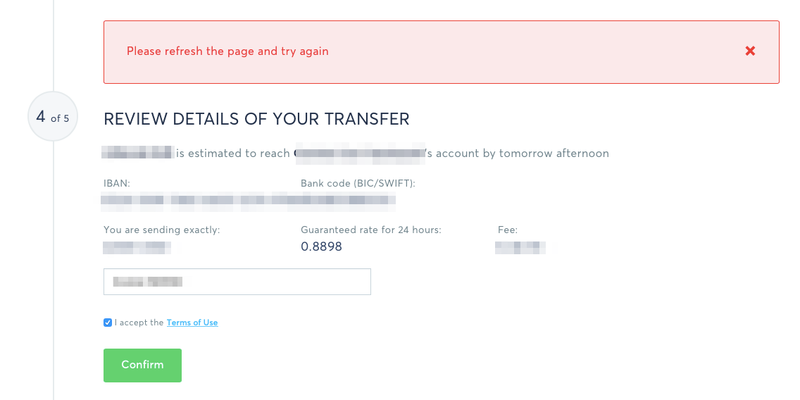 And… that drive costs 100 € less, so in addition, they’ll refund me 100 €! Now that is great customer support! When tens of thousands of customers, I suppose the laws of statistics dictate that you’re going to have a few disagreeable one. With those, it’s probably best to listen to what they have to say, and just move on. But given the effort we’ve put into making Rego a good product, I can’t help getting a little upset sometimes when I run across them. Perhaps the biggest struggle in the running a successful small company—particularly one participating in knowledge-based work—is deciding “what” to do. When I worked as an employee of another company, back in the day, I only had to worry about “how” I did my job; somebody else figured out the “what”. And deciding what to do is a dynamic and continual concern. Our organizations aren’t like a trains on guided tracks; they’re more like ships on the open sea, as each and every day brings shifts in wind and current; forces which—sometimes slightly, sometimes drastically—work to change our direction and pace. At the micro-level we have tools to help us more effectively “Get Things Done”, but those can also distract our attention from the macro-level issues of, “Are we doing the right things?” We have to be careful not to lose sight of the forest for the trees. But making knowledge work productive also requires ‘task study’ and ‘task management.’ It requires the analysis of the work itself. 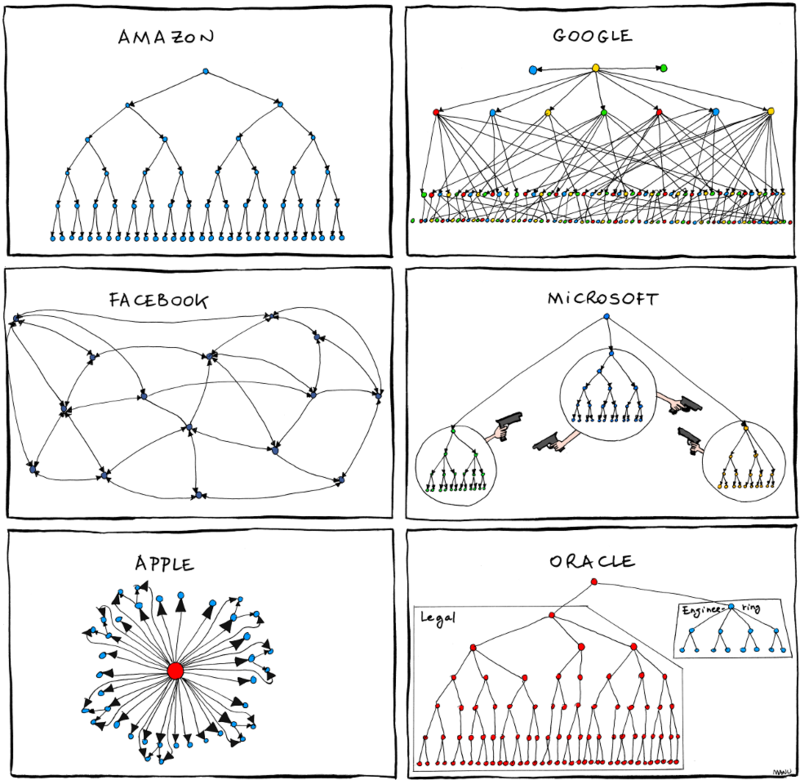 It requires understanding of the steps needed, their sequence and their integration into an organized process. It requires systematic provision of the information needed and of the tool needed. All of these are concepts of ‘scientific management.’ It does not require ‘creativity.’ It requires the hard, systematic, analytical and synthesizing work which Taylor developed to deal with shoveling sand, lifting pig iron, running paper machines, or laying brick. These challenges are both exhausting and exhilarating, but I don’t think I’d want it any other way; life’s just to short to be boring! I’ll buy from Amazon even if it’s not the lowest price. I trust them. I know third parties using the site will always come through, they’re afraid of getting blasted in the ratings. Amazon owns me. The article goes on to discuss how Marcus Sheridan came to own the pool business in the northeastern region of the US — by dropping traditional marketing and just doing some authentic, honest writing (i.e. developing trust). Uncivil comments not only polarized readers, but they often changed a participant’s interpretation of the news story itself. In the civil group, those who initially did or did not support the technology — whom we identified with preliminary survey questions — continued to feel the same way after reading the comments. Provide an opt-out link that does not require the user to login to some account. The worst experience I’ve had in this regard is Delta Airlines. I fly Delta, but got so tired of their SkyMiles emails that I decided to opt-out. This required hunting for my SkyMiles account login, and then hunting even more for the area in which you manage your email subscription. And then, worst of all, when I got there, I found that I was already unsubscribed. Dead end. What do you do in a situation like that? So I’ve blacklisted them in my spam filter. Sorry Delta. Don’t make your customers go through this. Provide an opt-out link that doesn’t require logging in. Provide the customer with the ability to opt-down, rather than opt-out. I’m usually interested in receiving information from the companies I do business with — I just don’t want to hear from them every day. With most companies, you can either opt-in or opt-out. Unfortunately, a lot of the businesses I love (like REI) can’t contact me anymore, because I got tired of the volume. 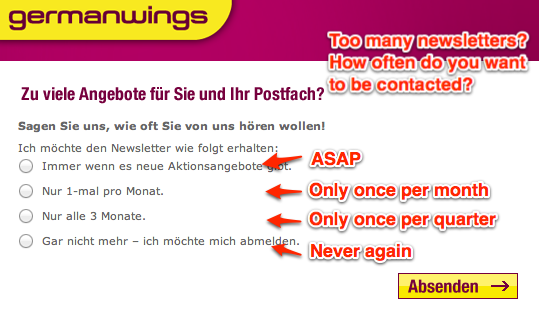 The Germanwings airline does it right. Here’s the choice I was offered when clicking their opt-out link. Rather than opting-out completely, I chose to allow them to contact me “once per quarter”. Nice! One of the most enriching things I’ve done in my life has been living abroad, experiencing cultures and societies completely different from those in which I was raised. That made me appreciative of things I formerly took for granted, and it exposed me to ways of thinking, living and doing things that otherwise may have never occurred to me. As regular Twitter users, we’re exposed each day to the stream of tweets from those we’ve chosen to follow. That stream represents a slice of the social universe that’s unique to us. If we imagine each of those voices as a distinct ingredient, the resulting social dish that we consume on a daily basis is one-of-a-kind in the flavors of culture, interests, education and point of view. It’s probably worth considering that that experience is less diverse and in certain ways potentially more influential that the real-world experience of the societies in which we live. So today I was imagining being able to “move” into the unique social experience of other Twitter users — i.e. being able to see the stream of tweets from another user’s followers — and wondering if it could be as enriching in the unexpected ways that moving abroad was for me. Would I more likely understand how a person could form an opinion that now seems completely unreasonable to me? Would I come to understand how some of my own viewpoints are limited or distorted by my own unique social exposure, repeated day after day?